As the White House faces court orders to reunite families separated at the border, immigrant children as young as 3 are being ordered into court for their own deportation proceedings, according to attorneys in Texas, California and Washington, D.C. Requiring unaccompanied minors to go through deportation alone is not a new practice. But in the wake of the Trump administration’s controversial family separation policy, more young children — including toddlers — are being affected than in the past. The 2,000-plus children will likely need to deal with court proceedings even as they grapple with the ongoing trauma of being taken from their parents. The U.S. Immigration and Customs Enforcement agency, which oversees the deportations of unauthorized immigrants, did not respond to a request for comment. Toczylowski said parents typically have been tried along with young children and have explained the often-violent circumstances that led them to seek asylum in the U.S. The children being detained under the new “zero tolerance” policy, though, are facing immigration proceedings without mom or dad by their side. READ MORE: What constitutional rights do undocumented immigrants have? “The parent might be the only one who knows why they fled from the home country, and the child is in a disadvantageous position to defend themselves,” Toczylowski said. Meanwhile, the broader legal situation is in flux. A federal judge Tuesday night commanded the White House to reunify families within 14 days if the child is under 5 and 30 days if the child is older. The Justice Department has not indicated whether it will appeal. Attorneys who are involved in the cases said it’s unclear how the judge’s order will work in practice, and when and how it could take effect. “We don’t know how the judge’s order is going to play out with reunification of children. What if parents have already been deported?” said Cynthia Milian, a Texas-based attorney at the Powers Law Group. In the interim, she added, the implications for kids remain an urgent concern. 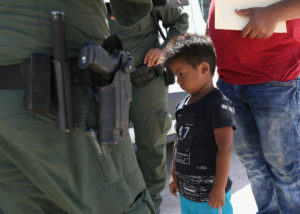 Given the trauma the children faced in their home country that spurred their families to flee and the pain of being separated from a parent, the expectation that children can mount a legal defense is “unconscionable,” said Dr. Benard Dreyer, director of the division of developmental-behavioral pediatrics at New York University School of Medicine. Leaders at three legal services organizations and a private firm confirmed that the children are being served with notices to appear in court. They are not entitled to an attorney but rather are given a list of legal services organizations that might help them. “That couldn’t be any less developmentally appropriate,” he said, adding that some children may not be mature enough to verbalize a response. More than 2,000 children who were separated from their parents at the border have been dispatched to the far corners of the nation to care facilities and foster homes. Officials with the Department of Health and Human Services emphasized Tuesday that the agency is working to unify children with either a parent or a sponsor. But it did not provide a timeline for how long that would take. “We are working across agencies for reunification of each child with [a] parent or family as soon as that is practical,” Jonathan White, HHS’ assistant secretary for preparedness and response, said in a media call. HHS representatives said children in facilities run by the Office of Refugee Resettlement receive adequate care, including medical and mental health services, and at least two phone calls per week with family. Yet children who are just arriving at care facilities are still not connected with their families, said Megan McKenna, a spokeswoman for Kids in Need of Defense. She said the children arrive at care facilities without a parent’s tracking number, and parents don’t tend to have their kids’ numbers. After kids arrive in care facilities, HHS officials work on finding a “sponsor” to care for the child, such as a parent, guardian, family member or family friend. Historically, unaccompanied minors — who tended to be teens — found a sponsor in about a month and a half. However, Rachel Prandini, a staff attorney with the Immigrant Legal Resource Center, said finding a sponsor is more difficult now given recent fears that stepping forward to accept a child could trigger a sponsor’s deportation. In April, HHS entered into an agreement with law enforcement officials that requires sponsors and adult family members to submit fingerprints and be subject to a thorough immigration and criminal background check. HHS officials said the process is meant to protect the child. Immigration lawyers from around the country have been flying into Texas to help represent children and families, said George Tzamaras, a spokesman for the American Immigration Lawyers Association. Ashley Tabaddor, president of the National Association of Immigration Judges and a jurist in Los Angeles, said that unaccompanied minor cases are heard on a special docket there. She said the judges who take the cases were trained during the last administration on children’s developmental stages, impulse control and making sure the proceedings are understandable to children. She said children seeking asylum tend to make their case in a non-adversarial office setting with a hearing officer. But that isn’t always the case, Prandini said. Lawyers might choose a strategy that requires more time in the courtroom. Toczylowski said her organization is trying to help reunify the families so the children can be tried alongside the parents. What constitutional rights do undocumented immigrants have?